Farmers composed 90 percent of the United States labor force in 1790. More than 200 years later, that population has dropped to 2.6 percent. Food production never stopped growing, but the industry has changed, consolidating small family farms into significantly larger operations and leaving only a small sect who continue to depend on this lifestyle. 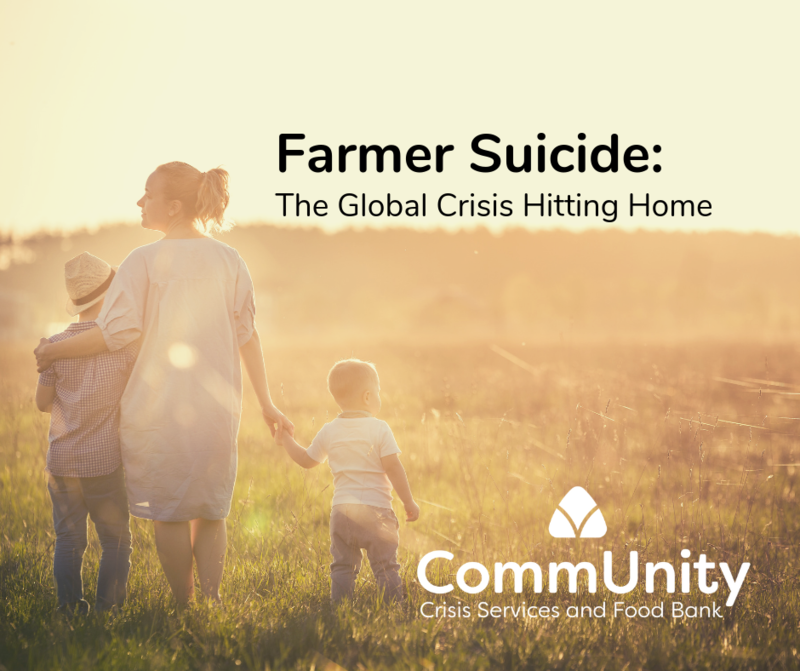 Farmers often bear financial and political burdens of this lifestyle in emotional solitude, which contributes to farmers dying by suicide at a higher rate than other populations. According to a University of Iowa study published in 2017, the annual suicide rate for farmers from 1992-2010 ranged from 0.36 per 100,000 farmers to 0.95 per 100,000 farmers. For all other occupations, the rate did not exceed 0.19 per 100,000 people. Farmer suicide deaths are widely thought to be under reported, leaving the possibility that the rate might actually be quite higher. Farmers dedicate every day to producing the world’s food; yet often wake up every morning facing financial stresses which might eventually force them off of land that often feels like part of them. In rural areas, this is magnified by stigma and lack of resources for managing this extreme stress. There are many sources of stress for farmers: uncertain climate, finances, political conflict, and health care issues, to name a few. Ultimately, though, it is the feeling of social isolation that drives so many to suicide. When farmers do talk about the stressors in their life, the Great Plains Center for Agricultural Health (GPCAH) at the University of Iowa found that they are most often reaching out to their faith leaders. CommUnity, formerly The Crisis Center in Iowa City, IA, has worked with GPCAH to coordinate Question, Persuade, and Refer (QPR) suicide prevention training for faith leaders in rural Iowa. CommUnity has also received funding from the Washington County Riverboat Association and the Cedar County Coop to lead QPR trainings in Washington and Cedar Counties in the coming months. By training members of the community who are already being called on during stressful times in suicide prevention, we hope to create awareness and opportunities for intervention. In March, CommUnity partnered with Iowa Concern to answer their farmer stress hotline overnight and on weekends. To access this resource 24/7, which can also help with legal, financial, and natural disaster information for farmers, call 1-800-447-1985 or chat at the Iowa Concern website. It’s still difficult for many farmers to access invaluable mental health resources, but the kindness of community can be enough to save a life. Look out for any changes in the ones you love and be sure to always ask genuinely and listen sincerely to how friends, family, and even acquaintances are doing. And if you or someone you know is in crisis, CommUnity Crisis Services staff and volunteers are available 24 hours a day, 7 days a week, 365 days a year by calling or texting 1-855-325-4296 or chatting at IowaCrisisChat.org. CommUnity provides education and training across the state. Learn more about hosting a training in your area.